I've been slowly putting Christmas away at my house. Packing away the ornaments and lights. It was a lot more fun the other way around....when the potential memories still loomed ahead. Each year (at some point) my family flies in and I watch these little ones grow and realize how much difference a year makes. Where will we all be a year from now? What will we be celebrating? What heart aches will we have all worked through? I want to freeze time. I want to squeeze more memories and projects into each day. I want to take more pictures before things change forever. I know that change is good. I know it's where we grow, but I just want to sit here for a moment in 2013. I know how to handle today. I can take what it's brought me, but I also know no matter what the next year ask of me-I'm ready. I've never not sat at the end of the year with things to celebrate and things that have helped me grow. I'm looking forward to the celebrations. I'm prepared for a few challenges. Happy 2014! I'm praying it finds you reflecting and holding tight to the beauty you found in 2013 and looking forward to fun ahead in 2014. I'll meet you back here next year-with a year full of memories you don't want to let go of because they were so amazing, and excitement packed in our mental bags for the year ahead. Last year my friend Kelly made this calendar for me. She found a song lyric for every month, and then attached a cute little icon. Pretty stinking cute, right? She attached the magnet to the pack of a clip for me to hang on my fridge. She gave me several copies, and I pinned one on my photo shutter as well, next to wear I usually hang out on my computer figuring out my schedule for the rest of my life. I loved it, and had to share....in case you need to stay organized, make a New Year's Eve favor, or just want to look in awe at the cuteness and creativeness that is Kelly. I've seen ideas like this floating around on the net, and I needed something a little different to give some of my friends last Christmas. I've moved through my collection of cookie recipes and small gifts, and so....mini champagne with attached straws and poppers made the cut. It took me awhile, and some bad decisions before I found out they sell mini four packs of champagne at most grocery stores (found mine at super Target for the same price as one mini bottle at a gourmet grocery store). In my defence, I'm not a drinker. I'm sure the cellophane wasn't necessary, I was going to fill it with crinkle paper, but decided not and....really life is best served in cellophane. Tag and tulle, my world, and my gifts were complete! I saw this idea on Lori's blog more than a year ago and I LOVED it. Last year I wanted to think of something different to give out to friends at work, and I took a leaf out of her craft book and put these little guys together for friends. It wouldn't be a new year without a can of black eyed peas. And for the record-eating two peas makes it plural....and that's all I can down on January 1st. These would be cute for favors for a New Year's Eve party, or in Lori's case, she brought these for her neighbors. Hoping you find a little magic this Christmas in the memories of the past and the many memories in the making. I cheated. I bought this, BUT to be fair....I have all the parts to make it....so I had to share because the idea is....I will be making a few of these. I love to travel, but there is only so much space in the house for albums. I've started making smaller albums that I can store in cute little trays and boxes around the house, and this little guy will be getting a home soon....just as soon as I bedazzle some of those pages....and when I'm done with that....I'll be using some of the license plates I've been saving over the years (I've also seen antique stores selling license plates for a few bucks each I might start picking up). But....cut some cardboard down to size, use some metal scissors (I always borrow them from one of my friends whose husband has a collection...I don't know....but before I buy 'stuff' like this I ask around to my friends with husbands with garages filled with stuff I just want to borrow once). File down the rough edge, then use one of the binder clips to snap those out, or take it to one of the Office Supply stores that do 'stuff' like this....they sell the combs and holes. I'll be making these little cinnamon scented soaps in the shape of gingerbread men. That process is here. I made these little felt gingerbread cookies a few years ago. It remains one of my favorite gifts...here is that process. 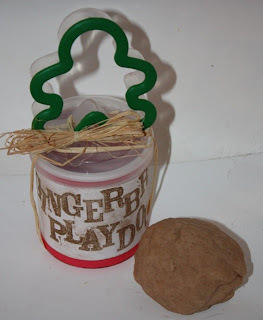 A few of the activities the kiddos are doing at my gingerbread party include gingerbread scented playdough. That recipe is here. I'm serving gingerbread pancakes. I blogged about that recipe here. ...and we are decorating gingerbread men. My very favorite recipe is here. I love it because they are soft and they hold their shape. This year I'm hosting a gingerbread brunch for my niece and nephew that are headed into town. I'll be posting those details...honestly, next fall. I've had a ton of fun planning everything. 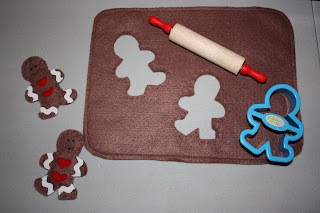 BUT...I'm headed to GMT tomorrow and my theme for the day is gingerbread. Here is one of the crafts the kiddos and I will be doing at my brunch! They are 4 and 2, so instead of making little gingerbread houses out of graham crackers, I found these little bird houses for a buck at Michaels. I sprayed them brown, and then found some glittery/foam stickers at Hobby Lobby and jewels they are going to use instead of candy. Totally durable, and they can hang them on their tree if they want as a little momento from this year's festivities. I'll share the finished products soon. In September some of the gals at work and I hosted a baby shower for Taylor. She welcome Baby Blaze into the world in September. We decided to carbo load. I threw a milk and cookies shower a few years back, so I pulled out some old favorites, and we added new ideas. For the sight in we got the book Goodnight, Goodnight Construction Sight and we all signed it for Blaze. The hostesses (there were a bunch of us) bought a monitor and we also each got packages of diapers. Laine had the idea of having the guest sight fun little "midnight messages" on the diapers for Taylor to enjoy during some of those late night diaper changes. Heather's husband printed out Blazes name and we put them on large milk jars we filled with flowers. Mini milk jars (I bought these at Hobby Lobby and use them all the time). We added mustaches to the straws b/c it's cute. ...and chocolate chip cookie dough cupcakes (I blogged about the recipe a few days ago-my favorite). I wrapped some story books in syran wrap and use these to hold the cupcakes. Each hostess also baked or bought cookies and we all pooled together our cookie jar collections to fill up. The guest ate at the shower, but there were also baggies for them to take home some cookies. A year before this picture, Quinn was being anticipated by this same crowd at a baby shower. This year she was a guest at the shower. ;o) I love looking at a year through babies! I cute down a wrapping paper tube and covered it with paper to look like a candy cane and added a label and postage. These made their way East and West at the beginning of the month to give the little ones something fun to do in anticipation of Christmas. Super easy, affordable, and fun for everyone....except maybe the postal workers that had to deal with, yet another, strange package passing through their hands. Here's an easy, last minute gift wrap idea...if paper is running low. My paper wasn't running low, I really just wanted to try this out b/c I like the look. I folded over newspaper and ran each side through my sewing machine with red thread. I slipped the gifts inside and added red bakers twine....I could write odes to baker's twine....but I won't....now. Add a tag, and I'm kind of digging the look! Cookie Dough Frosting...or as I like to say....Dinner! Ummm....I made these cupcakes for a shower a few months back and Oh. My. Goodness. This frosting and I got married. I just used a boxed cake mix b/c it was barely September, and barely the beginning of the year and I was barely sane. BUT I found the homemade icing recipe, then popped a chocolate chip cookie on top and it's one of my new favorites. It would make a great dip too and does taste like cookie dough, minute the eggs. Dip some graham crackers or a spoon and enjoy. I was able to generously ice 18 cupcakes with this amount of frosting.